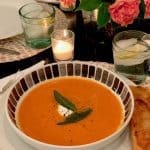 This is an easy to make, low-calorie soup. The garnish makes it a bit elegant. 1/2 - 1 tsp. Sriracha Sauce Start with 1/2 tsp. and taste. We like it spicy. 1/4 cup non-fat Greek yogurt Plus a few tsps. more for garnish if desired. Line a pan with olive oil and roast peppers and garlic at 425 degrees until skin is partially blackened about 10 to 15 minutes. Remove from oven and put in a covered dish. 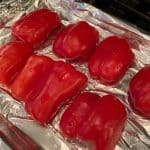 Once cooled, peel the skin from the peppers. I mostly just try to get the blacken parts off. Sautée chopped onion and garlic in olive oil until translucent. Add peeled peppers to the garlic and onions. I take scissors and cut the peppers into chunks while in the pot. Less mess. Add chicken broth to the pot and bring to a boil. Then, simmer partially covered for 8 minutes. 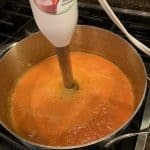 Turn heat off and use an immersion blender to blend. Or, let cool and use a regular blender, then return to pan. Blend in non-fat yogurt, Sriracha, and salt and raise the heat. Serve hot with a dollop of yogurt, crispy sage leaf and cracked pepper.